Living in the Midwest we know snow, ice or cold are part of winter. Keep in mind that although the snow may cause a lot of problems for adults, the kids and the farmers love it. The local weather stations let us know when impending storms will touch our areas and our lives. When the threat of a snowstorm looms, we all rush to fill up on milk, groceries, and bananas (seriously, you can’t find a banana anywhere 24 hours before a snowstorm in Kansas City). Stockpiling groceries is only one of the precautions you should take when preparing for a day or two or three of snowy winter weather. What else can you do to prepare? Heavy snow and ice can be synonymous with winter storms. 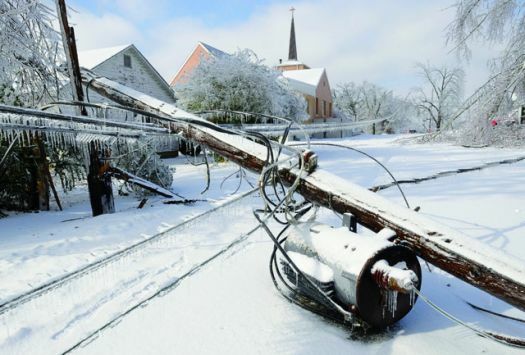 The snow and ice cause tree limbs to break under the added weight which in turn causes power lines to be affected. When severe winter storms affect the power grid, electrical blackouts occur. Gas pumps do not work during electrical blackouts. Although you may have no plans of going anywhere when you know a storm is coming, you should always be prepared in case you had to leave your house. Emergency situations can arise. Being prepared with a full tank of gas is a good way to prepare for a winter storm during a loss of power. You have no control over how quickly your electric company gets your power back on during a power outage. Having a generator to run a few select or all of your home’s electrical functions during a power outage could be a matter of life and death for some. If you have a condition that requires medication to be refrigerated, or a piece of equipment that helps you breathe at night, such as a CPAP machine for Sleep Apnea, then the threat of a disruption of your electrical power is more serious. For some, the thought of “camping” at home without lights or TV may seem like fun and it probably is for a day. A properly sized generator, which runs on propane, can be purchased to run a few appliances and lights or an entire home’s functions in the event of a power outage. Your driveway could have ice on it due to the storm. You never know when an emergency will arise and even though you can call 911, having options will be important. Keep in mind that salt can harm your driveway so salt alternatives should be considered whenever possible. A bag of salt will come in handy when you have to get up your drive or make sure that the steps leading up to your front door are safe. Preparing for winter storms could include keeping some items in your car handy in the event you are stranded and have to wait for an emergency crew. Keep a bottle of water, a blanket and your cell phone close when you are out driving in slick and snowy road conditions. Keep your fully charged cell phone in a zipped pocket on your body when you are driving. If you were to veer off the road and find your car turned on its side or upside down, being able to get to your cell phone to call for help is important. If your phone was in a cup in your console or a purse, it may not be unreachable in this situation and waiting for someone to discover you and your car may take more time than you are comfortable with. Prepare to be stuck, without power to your engine, when you drive in bad winter conditions. Winter storm can be beautiful and they can also be dangerous. Preparing for them will help you get through it with as much comfort as possible. Fill your gas tank, think about purchasing a generator, keep a bad or two of salt alternative around and make sure you keep a few safety items in your car in the event you are stuck on the side of the road. After each winter season, check the concrete sections of your driveway have not been affected by melting snow and ice. Concrete slabs can sink causing your driveway to crack. When this occurs call Concrete Raising Systems to evaluate the extent of your problem before it gets worse and costs more. This article was originallty pubished in February 2013 and has been recently updated.